The investigations into the sensational terrorist attack on Parliament appears to have hit a major roadblock with the Delhi police still awaiting a nod from the Lok Sabha Secretariat to take possession of certain “incriminating documents” seized from the Parliament complex and to quiz two BJP MPs in this regard. The Congress high command has ruled out a change in the party leadership in Maharashtra where the Congress-NCP government recently staved off a political crisis by winning a trust vote. The Maan dam oustees were unconditionally released by the police late last night and they resumed their month-old dharna at Tin Shed demanding rehabilitation of the displaced persons. The state Disaster Management and Rehabilitation Department has drawn up contingency plans for dealing with any eventuality arising out of delayed monsoons and resulting drought conditions. One person was killed and five others injured in separate incidents of stabbing and rioting in Jamalpur and Dariapur areas of Ahmedabad city and at Rajpipla in Narmada district of Gujarat yesterday, the police said today. 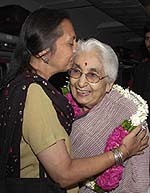 Capt Lakshmi Sahgal, veteran freedom fighter and trade unionist, has accepted the Left parties’ offer to contest the July 15 Presidential election against eminent missile scientist A.P.J. Abdul Kalam. A suite at a hospital here that treats many a VIP is ready for a special patient — Ms Priyanka Gandhi Vadra, the daughter of India’s-best known political family, who is about to deliver her second child. 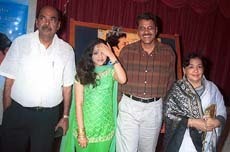 From left to right: Producer Dr D. Rama Naidu (MP) and new-find Richa Pallod, who plays female lead, with director Ravi Shankar and Farida Jalal at a party of Suresh Production's "Kuch Tum Kaho Kuch Hum Kahen" in Mumbai on Friday. Former Punjab police chief and currently Gujarat Chief Minister's Security Adviser K.P.S. Gill left for Washington today. A person was killed and six others injured when ultras fired at a moving goods train between the Hehegarha and Chipatohar railway stations in Latehar district in Jharkhand during the banned MCC-sponsored 24-hour statewide bandh today. After turning a blind eye to illegal encroachment of forestland by Tangia labourers in Gorakhpur, authorities now want them to move out. The Jim Corbett National Park in Uttaranchal holds a census of elephant population. Students of Allahabad University in Uttar Pradesh stage a protest against Pakistan, criticising the Central government for succumbing to US pressure and easing military pressure. The investigations into the sensational terrorist attack on Parliament appears to have hit a major roadblock with the Delhi police still awaiting a nod from the Lok Sabha Secretariat to take possession of certain “incriminating documents” seized from the Parliament complex and to quiz two BJP MPs in this regard. Sources associated with the investigations point out that it is crucial that these documents, currently in the possession of the Lok Sabha Secretariat, are corroborated by the two MPs before these are sent for further forensic and scientific investigations. These documents were recovered from the desk of Ajay Kumar, an employee of the Lok Sabha Secretariat, who was arrested on charges of having passed on sensitive information to terrorists while the attack on Parliament was being conspired. The seizure included some blank letterheads signed by two BJP MPs Mr R.C. Veerappa (Karnataka) and Mr Bahadur Singh Kohli (Rajasthan) — meant for asking starred questions in Parliament, sources said. Moreover, some blank forms bearing the signatures of these two MPs meant for issuing “general entry passes” for personal assistants/personal secretaries were also recovered from the desk of Ajay Kumar, sources said. The Delhi police wants that these documents, at present in the possession of the Lok Sabha Secretariat, be sent to the forensic laboratory for examination and also for graphology tests besides corroborating the recoveries with the two MPs. Meanwhile, it is learnt that four MPs belonging to the ruling NDA coalition, have urged Lok Sabha Speaker Manohar Joshi to refer the issue of granting permission to the Delhi police to the Privileges Committee. The request of the four MPs — Nihal Chand Jain and Chintaman Wanaga (both BJP), Trinamool Congress member Sudip Bandhyopadhyay and MDMK member Vaiko — comes even as the Privileges Committee under the chairmanship of Congress member Jaipal Reddy has already considered the issue and submitted a detailed report to the Speaker. These four MPs, in their letter dated June 6, have pointed out that the Privileges Committee had finalised the report on May 14 even as the members of the committee were not provided a draft copy. However, highly-placed sources said the report was finalised on May 14 in the presence of these four MPs among others, who did not raise any objection. Therefore, if their suggestion is accepted by the Speaker, it will only further delay the probe into the wider involvement of Ajay Kumar, against whom the Delhi police has not been able to file a charge sheet even though six months have elapsed since he was arrested. Moreover, the entire exercise will turn out to be a sheer wastage of time as the Privileges Committee has already dealt with the matter and the same procedures followed by it earlier will be repeated. According to sources Mr Veerappa and Mr Kohli did not participate in the proceedings of the Privileges Committee and the efforts of the committee to summon these two members on April 5 and May 14 to solicit their views before finalising the report went in vain. The report finalised by the Privileges Committee is understood to have recommended to the Speaker to allow the Delhi police to examine the “incriminating” documents seized from Ajay Kumar’s desk and also to allow investigators to question the two BJP MPs. The report is also believed to have recommended handing over of copies of Parliament questions raised by these two BJP MPs and the replies given thereof in the House, as sought by the Delhi police. The FIR (No. 328/2001) registered against Ajay Kumar, who was holding the position of Senior Executive Assistant in Lok Sabha’s question branch, accuses him of using the two MPs’ signed letterheads to ask questions pertaining to security issues and passing on the replies given thereof in the House to some officials in the Pakistan High Commission here. Mr Vyalar Ravi, AICC General Secretary in charge of Maharashtra, told The Tribune here that there was no move to replace Maharashtra Chief Minister Vilasrao Deshmukh and the party would concentrate on sorting out reasons that led to the political crisis. Conceding that demands were being made by certain sections for the removal of top party leaders in Maharashtra, Mr Ravi indicated that any change, either of the Chief Minister or the PCC chief, could complicate matters in a delicate situation and the party could ill-afford any groupism. He said the party leadership was satisfied with the way the Chief Minister had handled the crisis. Mr Ravi indicated that he had heard complaints about “unjust allocation” of portfolios from the Congress ministers and MLAs and efforts would be made to remove the grievances. There is a feeling in the Congress that “powerful” portfolios are with the NCP ministers. The AICC leader said the party would try to bring round the PWP which had abstained from voting during the trust vote in the Assembly. He admitted that mistakes had been made and the reinduction of an NCP MLA into the ministry, which triggered off the political crisis, should have been handled carefully. Citing instance of Mr Padmakar Valvi, he said the Congress MLA was confined by the BJP-Shiv Sena workers and he had to make his escape after great effort. He said the instance of confinement of Mr Valvi forced the Congress to take its MLAs away from Mumbai as the government did not want any scuffle with the BJP-Shiv Sena workers. The MLAs, he said, would have been under mental pressure had they stayed in Mumbai. The police had swooped on the dharna site on June 13 and dragged the 200-odd men and women, to the waiting buses and put them in jail. The Maan dam on the river Narmada is slated to submerge 17 villages inhabited by around 6000 persons this monsoon. Four of the protesters, — Ramkunwar, Chittaroopa Palit, Vinod Patwa and Mangat Verma, who had started indefinite fast 26 days ago had gone underground as the police went to pick them up on the night of June 12. They are continuing their fast and their condition has become critical, according to a spokesman for the Narmada Bachao Andolan (NBA) which is spearheading the agitation of the Maan dam oustees. NBA leader Alok Agrawal, who was also arrested and released along with others, told mediapersons today that a representative of Chief Minister Digvijay Singh had offered them yesterday a proposal that a committee headed by former Supreme Court judge and former Press Council of India chairman P.B.Savant would examine the claims and counter-claims made by the government and the NBA about the resettlement of the Maan dam oustees. Mr Agrawal said the NBA had agreed to the proposal and a draft agreement was prepared for signing by the two parties. But at the last moment the government backed out. Meanwhile, the Jan Sangharsh Morcha, a confederation of the NGOs announced today that it would launch an agitation in Madhya Pradesh and outside to expose the Digvijay Singh government’s anti-tribal and anti-Dalit actions. Sources in the department said directives had been issued to the district administration in the 13 districts of the state to gear up their machinery to meet any challenge posed by drought. If such a situation ever arose, it would adversely affect the irrigation and drinking water supply. The district administrations have been asked to ensure complete implementation of the relief plan in case of any contingency, the sources added. The departments of Irrigation, Urban Development, Rural Development, Energy, Agriculture, Health, Animal Husbandry and Forest have also been instructed to coordinate with the Department of Disaster Management and Rehabilitation, besides submitting an action plan. The sources said various departments had suggested proper activation and utilisation of resources, including the power supply, to ensure adequate supply of irrigation and drinking water. One person was stabbed to death and two others, including a woman, were injured at Jamalpur while another person was injured in stabbing at the Dariapur area. At the Rajpipla town of Narmada district, two boys from different communities were injured when they were attacked by mobs. However, the situation have been brought under control. A traffic constable was stabbed to death by an autorickshaw driver at Una town in Junagadh district of Gujarat yesterday, the police said here today. She is excited about it, sources said. Earlier on her arrival here from Kanpur, she was accorded a warm welcome by her admirers. The 88-year-old doctor, who runs a clinic in the industrial town of Uttar Pradesh, was closely associated with the Indian National Army of Netaji Subhash Chandra Bose. She will file her nomination papers on Monday, said CPM General Secretary Harkishen Singh Surjeet, here today. A bed has been prepared at Sir Ganga Ram Hospital to receive Ms Priyanka, 31, and the security staff has been alerted for her second short stay at the hospital. Ms Priyanka, daughter of Congress party leader Sonia Gandhi, is married to businessman Robert Vadra and gave birth to her first child, a son, at the same hospital in 2000. “Last time she stayed in a suite that had a separate room for an attendant and an attached bathroom. This time too we are keeping one of the suites ready,” a hospital official said. The hospital has treated many VIPs, as it caters to 40 different specialities, and was set up in 1954 by India’s first Prime Minister Jawaharlal Nehru, the great-grandfather of Ms Priyanka. The doctor who attended on her last time, senior gynaecologist S.K. Bhandari, is in charge of her this time as well. Officials are, however, tight-lipped about the due date. “Predicting a date is difficult,” is the only answer of the staff. Though officials said they had their own men to handle security arrangements at the hospital, Ms Priyanka will be given protection by the Special Protection Group (SPG), which also provides security to Indian Prime Minister Atal Behari Vajpayee and Mrs Sonia Gandhi. “There will be no extra checks or stops for people entering the hospital. It’s the SPG that will take care of her. Like last time they will guard her room and check those visiting her,” the official said. Mr Gill has been invited by the American Foreign Policy Council (AFPC) to attend a series of discussions with opinion-makers in Washington, including members of Congress, various Government officials, and a number of prominent counter-terrorism specialists and think-tank. The discussions will primarily focus on “strategies and priorities in the global war against terrorism”, with special reference to the current situation in South Asia.